Fass, behind the mic, “used the mixing console the way an artist uses paint,” says Steve Post. A documentary on this year’s film festival circuit examines the legacy of a New York countercultural legend whose techniques for mixing music and conversation in live radio shows had a profound influence on noncommercial broadcasting and the musical sensibilities of his generation. Radio Unnameable is a love letter to the radio show hosted by Bob Fass, who has produced a live free-form broadcast under the same title on Pacifica’s WBAI for close to 50 years. Fass is acknowledged as the master of the spontaneous mix and the man who turned free-form radio into an art form. Radio Unnameable premiered in April at the Full Frame Documentary Festival in Durham, N.C., and will be screened at the Silverdocs Documentary Festival in Silver Spring, Md., June 23 and 24. It will also be screened — and celebrated — in New York on June 26 during the Brooklyn Academy of Music’s BAMcinemaFest. Fass, who will turn 79 this month, began Radio Unnameable in late 1961. At the height of his popularity, which extended through the first half of the 1970s, he was on the air five nights a week from midnight to 5:00 a.m. His program, which now airs every Thursday after midnight, is a mix of listener calls, studio interviews, recorded music, live performance and anything else Fass can patch into a mixing console. New York–based filmmakers Jessica Wolfson and Paul Lovelace, a husband-and-wife team, produced and directed the film. While neither are longtime WBAI listeners, Wolfson reports that her mother was “a big BAI fan.” Wolfson grew up in New York but had never heard of the events Fass had a hand in instigating. “He’s someone who was so influential during a specific time and touched a lot of people, but he has fallen to the wayside in terms of his popularity, and that really drew me to the story,” she said. Fass came to the filmmakers’ attention when Lovelace was working on a documentary about the psychedelic folk duo the Holy Modal Rounders. Peter Stampfel, a member of the now-defunct group, still performs live on Radio Unnameable broadcasts. The documentary describes Fass as a pioneer in presenting live music on the radio, and credits him for introducing radio listeners of the 1960s to an unknown artist named Bob Dylan, one among many who strummed their guitars in appearances on Radio Unnameable. Arlo Guthrie’s “Alice’s Restaurant” had its first radio airing as a live performance on Fass’ broadcast, and when Jerry Jeff Walker sang “Mr. Bojangles” for the first time before an audience, it was for “Cabal,” the name Fass coined long ago for his listeners. There was no such term as “flash mob” in 1967, but that’s what showed up at the International Arrivals Building at New York’s Kennedy Airport on Feb. 11, 1967. Dubbed the “Fly-In,” the mass gathering of likeminded souls was the first countercultural happening in the city, and Fass organized it on the air. Several thousand people showed up to join the party. Two months later, hordes of Fass’ listeners eager to re-create the good vibes converged in Manhattan’s East Village for a “Sweep-In,” to clean streets deemed neglected by the city’s sanitation department. Independent radio producer Larry Josephson, who had a long run doing a free-form morning show on WBAI, credits Fass with teaching him how to do live radio. 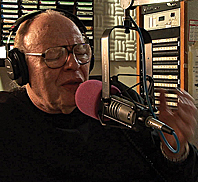 Longtime colleagues have noted that Fass was never able to pursue a broadcasting career outside of WBAI and Pacifica, despite his bitterness at not being paid in 35 years. Whether that resulted from an unwillingness to forego the great freedom he has had at Pacifica, or an inability to function in the straighter world of commercial or public radio, is a debatable question that the film does not explore. Listeners from distant states do catch Radio Unnameable over WBAI’s live Web stream, but the show has had only limited success in gaining carriage on community radio stations around the country. A handful of small outlets in upstate New York, Alaska and British Columbia once carried the program, but Fass said all three have dropped it, citing excessive fundraising on WBAI. WBAI alumnae who have seen the film described another omission, saying it doesn’t adequately reflect Fass’ generosity of spirit. The film project included an effort to preserve Fass’ audio recordings. Mitch Blank, a self-described musical archaeologist who provided rare recordings to Fass over the years, worked with Wolfson and Lovelace to rescue and preserve the Radio Unnameable archive, which had been in disarray inside Fass’ house on Staten Island. In 2008 and 2010, dozens of listeners and friends of Fass participated in weekend work parties. About 4,000 reels were organized by year, placed in more than 100 large plastic bins, entered into a database and moved off the premises. “We realized that in order to make this film we needed access to that material,” Wolfson said. The archive, now stored in a warehouse in the Washington, D.C., area, was appraised in 2011 by Syracuse University. The archive includes Fass’ field recordings at the tumultuous 1968 Democratic National Convention in Chicago, hours of in-studio appearances by Paul Krassner, Abbie Hoffman and other Lower East Side activists who, with Fass, co-founded the Yippies. Considered a treasure trove of 1960s counterculture politics, the archive is said to be valuable for its recordings of a wide range of folk and popular music. Sean Quimby, senior director of special collections for the Syracuse University Library, confirmed that negotiations to purchase the Radio Unnameable archive are ongoing. terrific details and cannot wait to see doc if it gets to LA LA land….